This time of year, watching performances of those teams who exited Colorado to play elsewhere is most intriguing to me. The summer months are so warm across the country that the VMI's are next to nothing. While it is nice to know "when" a team will have no ill effects or advantages given by the air, the larger VMI's can be fun to watch. Jon Gray pitched his heart out last night against the Angels, but the Rockies lost in an all too familiar fashion. A few days ago, I listened to a radio discussion by Mark Schlereth, a former Denver Broncos and Washington Redskins lineman (whose son is a minor league pitcher) on 104.3 FM The Fan. Mark was describing what he felt was the issue for Jon Gray and some of the younger pitchers on the Colorado Rockies’ staff. The question opening the discussion was, “What is it going to take to get some of these talented young pitchers like Jon Gray, to become Aces?” In answering that question, Mark whom I think is one of the best minds in sports and I respect his approach and his reasoning capability, answered the question in an “old school way of thinking”, which I believe to be a stumbling block to a higher level of analysis. Bear with me as I explain. Mr. Schlereth’s answer was that these young pitchers tend get fatigue in their fingers and it causes their pitches to run back over the plate where they don’t want the placement of that pitch to end up within the zone. Naturally they get hit harder sometimes. And, what they need to do is get a little older and stronger, so that does not happen as frequently. Now, it is interesting that these older coaches assume they know when fingers are getting fatigued, when the player himself does not. You see this is the mentality of major league baseball. They imagine something that there is absolutely no way to check to see if it is the truth and they go with it. Here’s the problem. What if it has nothing to do with the pitcher himself, but the air he is pitching through today? Jon Gray pitched his pen day in Colorado before traveling to Anaheim to throw his game day. The four seam fastball (which we have tons of scientific truth behind) lifts 3 inches more and tails sideways 4 inches more in Anaheim than in Colorado under these conditions. Duh…How is a pitcher supposed to maintain his precision when that happens? He can’t. But, the older guys coaching who have absolutely no concrete facts, tend to repeat what they’ve heard other respected coaches say, so they indoctrinate the younger want-a-be’s with the same mentality. They are getting no closer to the truth that creates championships. Peyton Manning would be aghast if he knew what is happening in Major League Baseball. To further explain, a pitcher must create his speed with his legs, his torso, his shoulder, elbow, wrist and fingers. If any one of those parts is actually fatigued, then his speed will suffer. Once the ball is free from his fingers, it is flying freely through the air. How, then can fatigued fingers cause the ball to get more movement at the same speed? If the release caused the ball to come out differently, it could be proven with our slow speed cameras. 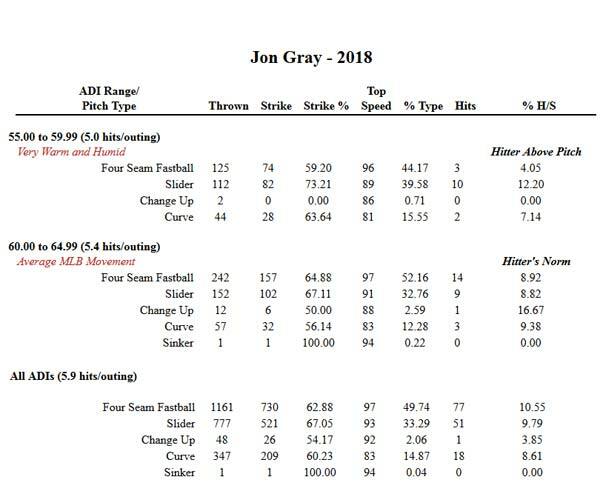 On the other hand, Gray’s data from last night shows he was throwing too many strikes with his 4-seamer. At over 70% strikes, but his normal speed at 97 mph – it would indicate his placement was not as precise as normal. 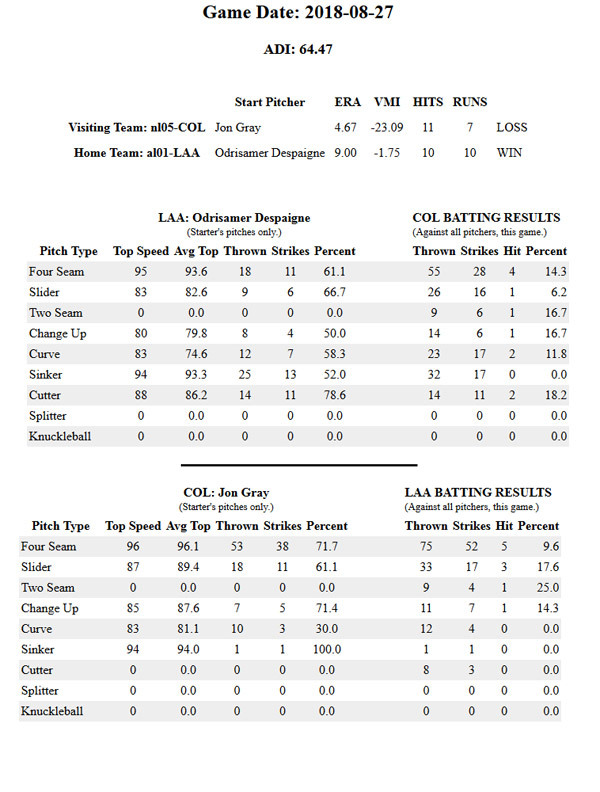 He normally throws at the rate of 61 to 64 percent strikes which is normal for MLB. Yes, he was catching too much of the plate, but not from fatigue. To further illustrate, Ottovino a relief pitcher who would not have thrown enough pitches to get fatigued, was the bigger problem. In his 28 pitch outing, he walked three hitters, throwing between 40% and 50% strikes. His norm is 62 to 65% strikes. Fatigued fingers? I would stick with the scientifically provable understanding of more movement than they are used to having upon leaving Coors Field where they pitched their pen-day.